One of the benefits of MomsTeam Institute | SmartTeams being based in Massachusetts is the opportunity to support the runners in the Boston Marathon, one of the nation's most prestigious races, known for low qualifying times and tough terrain conditions. In particular, marathon weather conditions can be unpredictable, from snow squalls to extreme heat, which may lead to increased risks of life-threatening medical emergencies, including exertional heat stroke (EHS). EHS may develop during exercise, strenuous work, or physical exertion, and it can result in death or potentially irreversible damage to the brain and other vital organs. It is more common in warmer weather, but can occur even if the outside temperature is not particularly high. EHS often affects younger, fitter people. Known risk factors of EHS are high ambient temperatures, the degree of exertion, lack of heat acclimatization, and inadequate hydration, which are frequently seen in marathon events, for example. "After a long winter, runners who were overheated with exhaustion and dehydration were far greater in number at this year's marathon than last year," said Chris Troyanos, the marathon's medical coordinator. Temperatures at this year's marathon were reported at close to 75°F, with relatively high humidity. Nearly 1,600 runners required medical treatment and a total of at least 21 runners, 19 with EHS, were transported to Boston-area hospitals. "We were anticipating the high numbers, contrary to what some media outlets may have reported. It was the combination of high heat and humidity, and lack of adequate heat acclimatization," said Troyanos. During marathons and other instances of high EHS risk, monitoring for early signs of an injury is critical. It's also extremely helpful to know an individual's medical history, as athletes with a history of heat illness may be more susceptible to a repeat heat illness experience. Troyanos noted, "Every one of the runners has a bar code on their bib. When they come into our tents, we are able to scan the code and immediately pull up their medical histories, so we know what we are dealing with." Along the 26.2-mile route, MomsTeam Institute | SmartTeams handed out bandages and monitored for injuries. 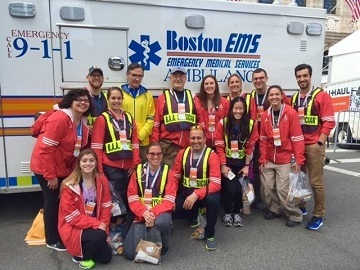 Dr. Lyle Micheli, a board member and director of sports medicine at Boston Children's Hospital, provided medical support for runners at the finish line - a role he has had since 1975. After this year's marathon, I talked with Dr. Micheli about the types of injuries he has seen over the course of 42 years volunteering. Nothing, of course, compares to April 15, 2013, when two homemade bombs exploded near the finish line in Copley Square, killing three people and injuring several hundred others. Dr. Micheli has worked in all types of weather conditions and has seen all types of injuries, with the most serious involving the heart and heat. This year's race was run in some of the warmest conditions since the event began in 1897. "I can always tell who is from the colder climates and not heat acclimated, whereas runners from Florida cross the finish line chipper and well acclimated," said Dr. Micheli. "Boston Marathon protocol for EHS includes having six cold water immersion tubs set up in the tent at the finish line. This year, the people who experienced EHS were cooled in the tubs before medical transport, because time is critical in treating EHS. If an individual is suffering from EHS, survival rates are the highest if we can decrease the body's core temperature to less than 104 degrees within 30 minutes," explained Dr. Micheli. "More than any marathon in the world, we work with all of the area hospitals to prepare them for emergencies months in advance of the race," Troyanos noted. "We have an excellent working relationship and could never do this alone. It truly takes a team," he said. Each year, I marvel at the way volunteers choreograph the marathon. At sporting events, a safety action plan can help prevent life-threatening medical emergencies associated with heat and extreme weather. While EHS is a risk in sports, no one should die from EHS. To that end, I'm working with The Heat Factor, an educational program designed to help people learn more about the risks and dangers of EHS and to take steps to minimize these risks. For more information, visit TheHeatFactor.com . Brooke de Lench is Founding Executive Director of MomsTEAM Institute, Inc., Director of Smart Teams Play Safe, Publisher of MomsTEAM.com, author of Home Team Advantage: The Critical Role of Mothers in Youth Sports (HarperCollins), and Producer/Director/Creator of the PBS documentary, "The Smartest Team: Making High School Football Safer." Brooke is also a founding member of the UN International Safeguards of Children in Sports coalition and is a regular contributor to Huffington Post. She can be reached by email delench@MomsTeam.com , and you can follow her on Twitter @brookedelench.